The global fuel additives market is expected to register a CAGR of 4.92% during the forecast period, 2019-2024. The market is driven by factors, such as enactment of stringent environmental regulations, rising global passenger traffic contributing to the growth of the aviation market, and increasing demand for clean and efficient fuel. Fuel additives are an integral part of automotive, industrial, and aerospace applications. In this report, the principal end-user industry segments taken into consideration are diesel, gasoline, jet fuel, and other applications. Fuel additives aid in minimizing emission and enhancing the performance of the vehicle. Environmental concerns related to depletion of resources are creating considerable demand for fuel additives. Subsequently, public health concerns and environmental effects of the additives also come into consideration. As a result, the US Environmental Protection Agency (EPA) enacted the Clean Air Act, focusing on the impacts of the fuel additives (both gasoline and diesel), which mandates the registration of fuel additives used in the automotive industry. Governments across the world are also currently focusing on enhancing fuel economy as per the Corporate Average Fuel Economy (CAFE) standards. Such a shift in focus has further increased the importance of fuel additives. The global diesel fuel additives market is exhibiting stable growth on account of increasing applications, technological advancements, and the growing demand from the end-user industries. Diesel additive is the major application of fuel additives. Fuel additives are designed to meet the increasingly stringent environment norms, as several countries are implementing regulations to control emissions. These regulations, increasing demand for clean and efficient fuel, and depleting crude reserves are the main drivers for the market. The diesel additives market is witnessing an increase in demand due to the increasing consumption of Ultra-Low-Sulfur Diesel (ULSD), which requires higher concentration of additives. However, growing development of hybrid engines and plug-in electric vehicles in developed economies is acting as a hurdle for the growth of the diesel fuel additives market. 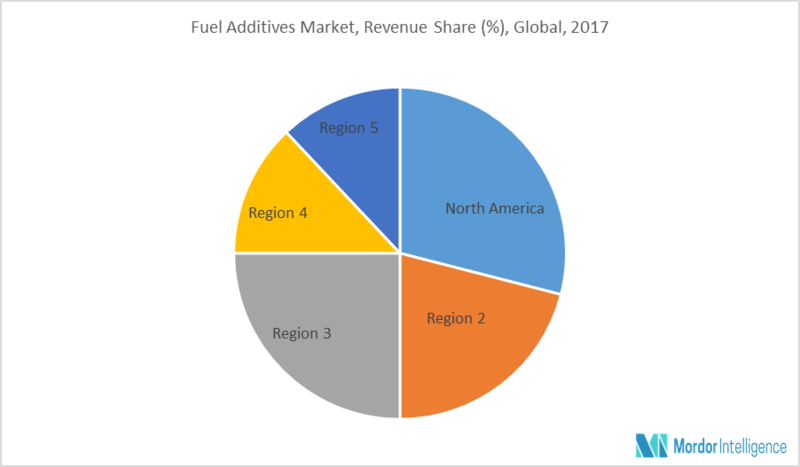 The demand for fuel additives in the North American region is growing at a healthy rate, owing to the increasing government regulations on emissions, along with increasing investments in the development of newer additives. Gasoline fuel additives have been one of the most dynamic segments of the industry in the past decade, and will continue to likely offer opportunities, especially for better performing products. Additionally, fuel ethanol is the most excessively used fuel additive in the United States. Growing demand for fuel additives, abundant availability of biomass feedstock used for the production of biofuels, and mandates issued by the US Environment Protection Agency (EPA) on biofuels consumption are anticipated to drive the demand for fuel additives in the United States. Major Players: BASF SE, Afton Chemical Corporation, Chevron Corporation, Evonik Industries, Lanxess, and Total, among others.